How to be successful with Scentsy is a question every new Scentsy Consultant wants to know. For me, it was my determination to succeed! Before I chose to join Scentsy, I first figured out what my “why” was. Why sell Scentsy if I wasn’t dedicated enough to put in the effort. I joined Scentsy, got my start up kit, had all these great plans to be successful, and then life happened. My Scentsy story starts with me. My name is Angela Tippets, and I’m an Independent Scentsy SuperStar Director. My husband’s name is Scott, we have been married for 20+ years, and we have 3 almost grown children. Due to my husband’s various jobs in the grocery industry, our family has moved 11 times and we were looking for stability (in a job & in location). In April 2007, I was introduced to Scentsy shortly after a close call with tea light candles. While living in Meridian, Idaho, and working in a kindergarten classroom, I noticed the teacher had a Scentsy warmer. I didn’t know what it was at the time, but thought it was SO COOL! She explained how it worked, and how safe Scentsy Warmers are around children. This was a “light bulb” moment for me. I went to bed that night thinking about the Scentsy products and opportunity, and woke up still thinking about it. I never attended a Scentsy party, but joined on a leap of faith. After starting a Scentsy business, I caught what we like to call “Scentsy Spirit”. Shortly after joining, our family moved to Ohio. I chose to put Scentsy on the “back burner” to pursue my teaching degree –hoping that would give our family a little more stability. In August of 2008, with a little push from Scott, I attended my first Scentsy Convention in Boise, Idaho. I had so many “aha” moments and learned that I could do this business. My eyes were opened to new possibilities, my spirit was touched, and the paradigm of my goals began to shift. Again, I was not sleeping at night because of the excitement I was feeling. It’s great to be part of an amazing family company. After returning home from Boise, I told Scott my dilemma. I saw so much potential with Scentsy, and yet I had this goal to be a teacher. After praying about it, I felt there were people out there that needed this opportunity way more than I did. I thought about how blessed we are and how I could be an example for others. I told Scott that I didn’t want the kids to think I had set this goal for myself to teach, then not “finish what I started”. He said, “The kids need to see you happy; “do” what will make you happy.” From that point on, Scentsy has been my full-time business and I haven’t looked back. I have had the opportunity to set and reach so many goals. I am amazed at how much my life has been blessed because of the Scentsy opportunity. Who knew that a $99 start up kit would change and bless my life. In October 2010, I reached the level of Scentsy as a SuperStar Director, the top 1% of the company. This was due to the help of our amazing team (The Awesome Group), my supportive family, and a lot of effort, focus, and drive. It’s been fun setting and reaching goals and I love to earn awards for my accomplishments. Scentsy changes lives, and our family is an example of that. Scott and I have had the opportunity to travel on amazing Scentsy incentive trips for free. I work Scentsy full-time and have team members all over the United States, Canada, Australia, Mexico, Europe, and New Zealand. I love our global Scentsy Team! Our next big goal is to have Scott work Scentsy full-time with me. We both love sharing Scentsy products and the Scentsy opportunity with others. Scentsy really has been a blessing to our life and the life of our family. 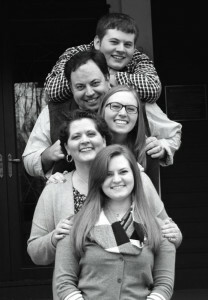 In 2012, our 15-year old daughter was diagnosed with ovarian cancer. It was a diagnosis that stopped us in our tracks. What a blessing it was to have my Scentsy business. The beauty of the direct selling business model is that we can take time off as we need to. What a blessing to be with Madisen 100% of the time during her treatments! Our Scentsy Family was a HUGE support network during our time of need. Scentsy Consultants jumped in and helped my team with whatever they needed. Who does that? What company does that? I still got paid every month! It’s a great feeling to be a part of the Scentsy Family, and watch as it continues to bless the lives of so many around us. After all these years, even in an unstable economy, we have been blessed with stability. We continue to mentor others, have met life-long friends, and continue sharing our business with others. Our business is our passion.